Can I use HTML Agility Pack in Windows Forms Applications? I have imported the library needed it this code which are using HTML_Agility; using HtmlAgilityPack; and I also add reference to its DLL file but it can't help me so much. Do you know why this happens and how to fix it? 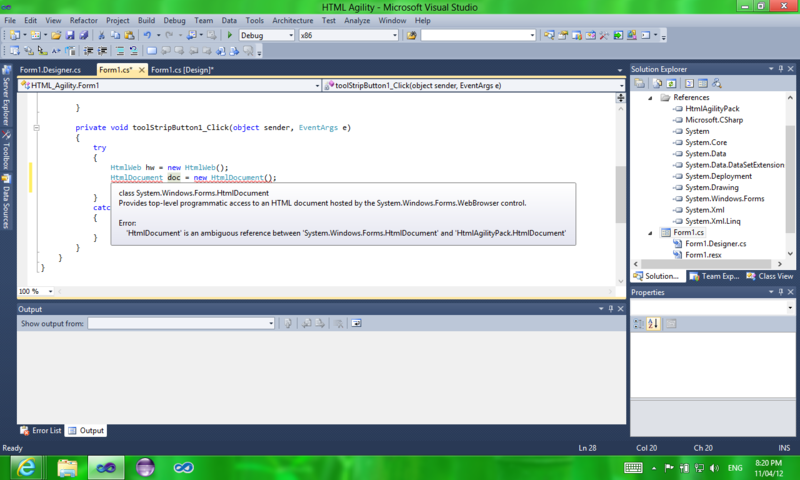 There's also exists a System.Windows.Forms.HtmlDocument class. Try explicitly qualifying your classname instead of using a using statement, or rename the class with a using statement such as using HAPDocument = HtmlAgilityPack.HtmlDocument; (and then use HAPDocument instead of HtmlDocument in your source code).